Every Christmas, my family looks forward to the treats I bake for them. I love baking, it is really amazing to create something start to finish that is delicious and even more amazing to watch the ones you love enjoy eating it. 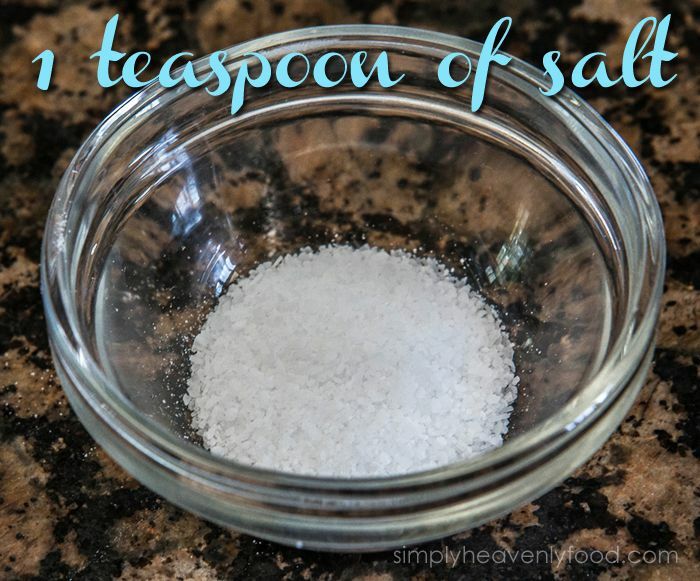 It's a simply heavenly recipe that I discovered while watching an old episode of Martha Stewart living. 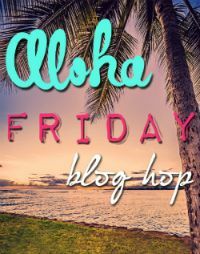 I changed a few things to adapt the recipe to my tastes and I explain that throughout the post with phots. 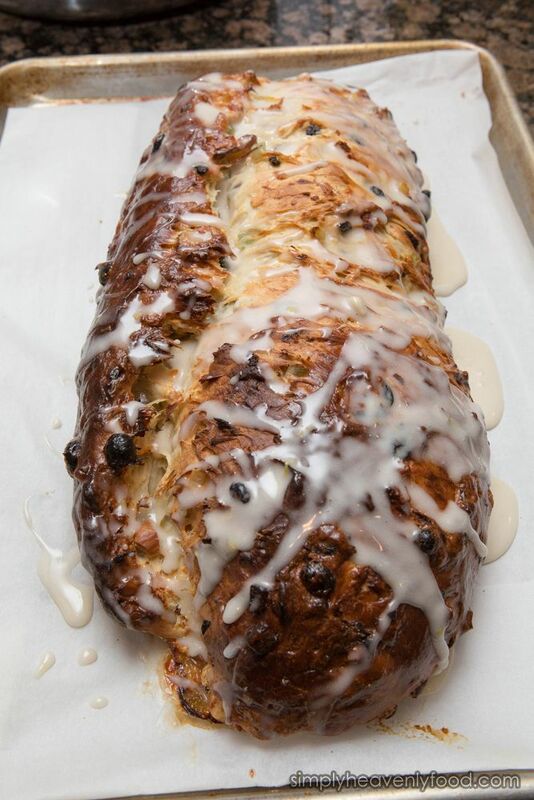 Stollen's richness is similar to that of brioche, but dried fruit makes it sweeter and gives it a more interesting texture. 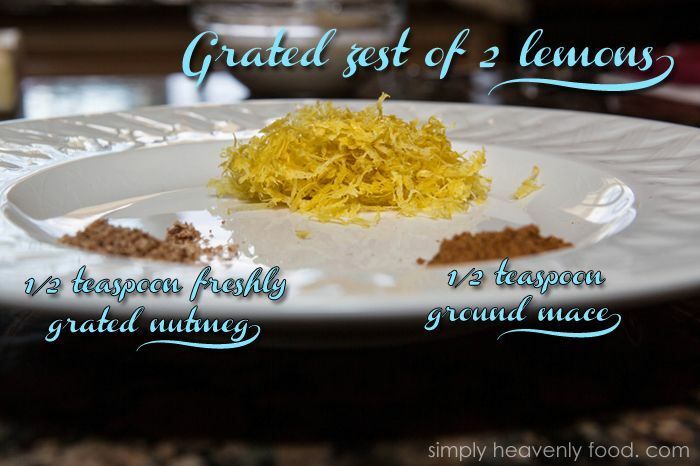 Serve this rich holiday treat in thin slices as breakfast bread or with afternoon tea. 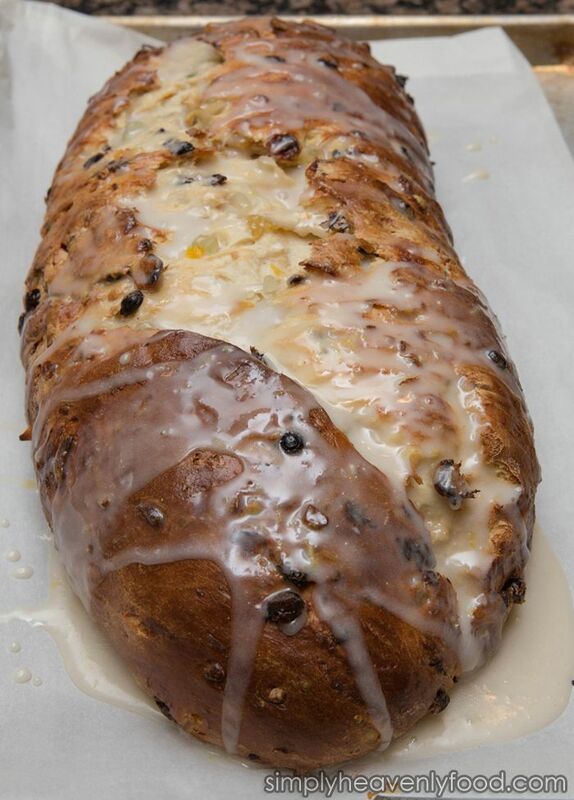 Like fruitcake, stollen improves with age and can be made up to three weeks in advance. 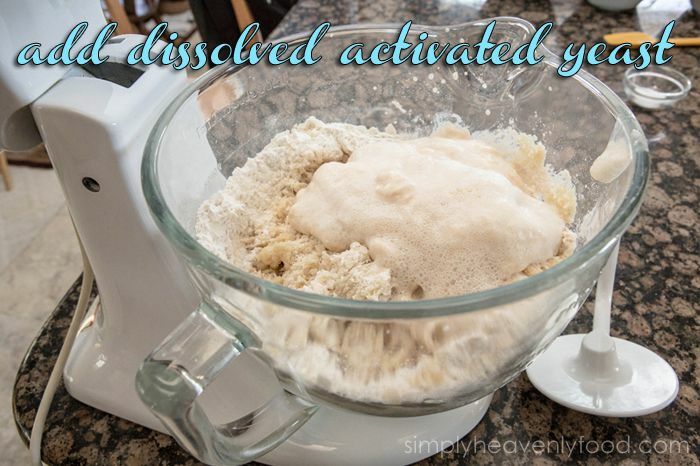 In a small bowl, combine yeast and 1/2 cup warm water, and let stand until foamy, about 10 minutes. 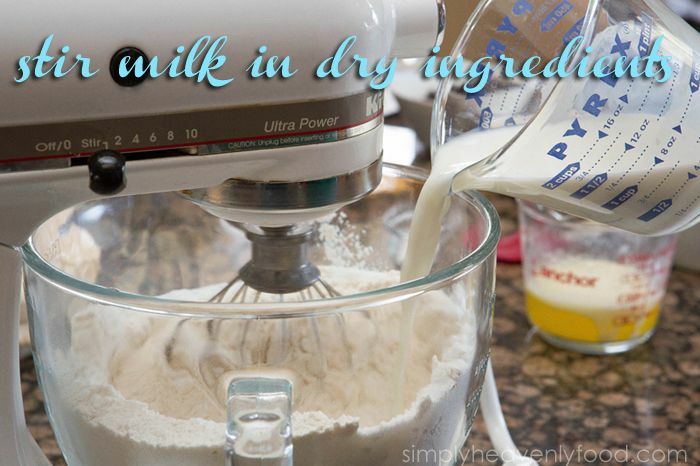 In a large mixing bowl, sift together dry ingredients. 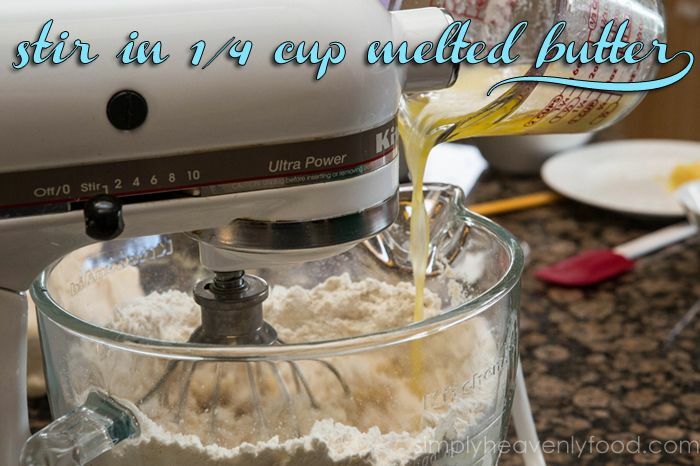 Stir in milk and 1 1/4 cups melted butter. 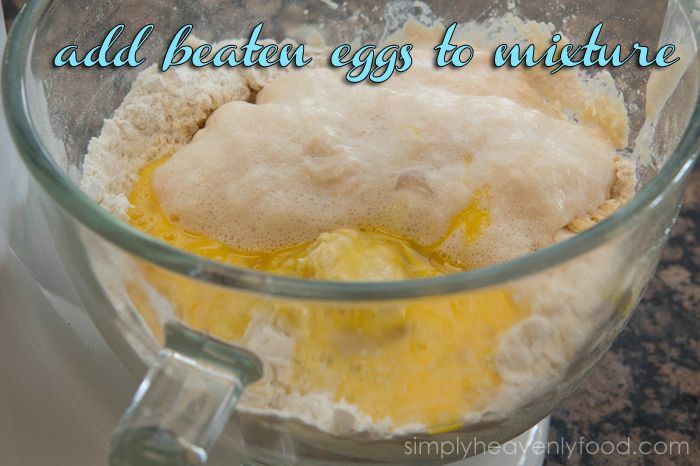 Add dissolved yeast and eggs. 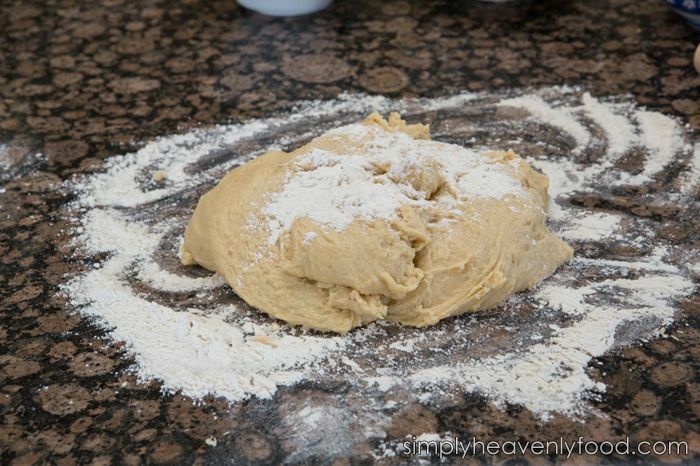 Turn dough out onto a floured surface, and knead until fairly smooth. 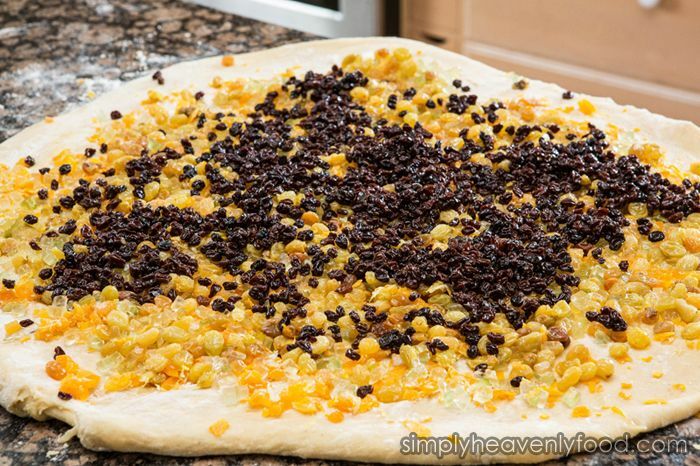 In two separate bowls, soak currants in cognac, and raisins in orange juice. Let each stand for 10 minutes. 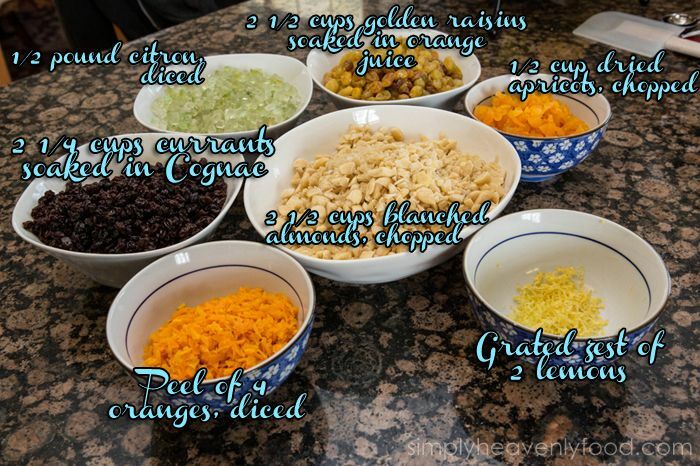 In a medium-size bowl, mix together currants and raisins with their soaking liquids, the orange peel, lemon zest, citron, apricots, and almonds. Work mixture into dough. Continue kneading for about 10 minutes. 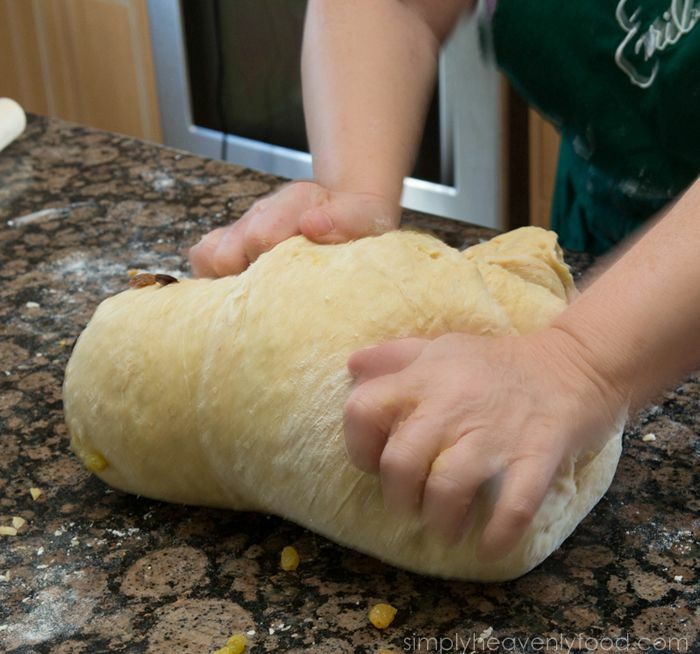 If dough is sticky, knead in more flour, but be careful not to overwork. 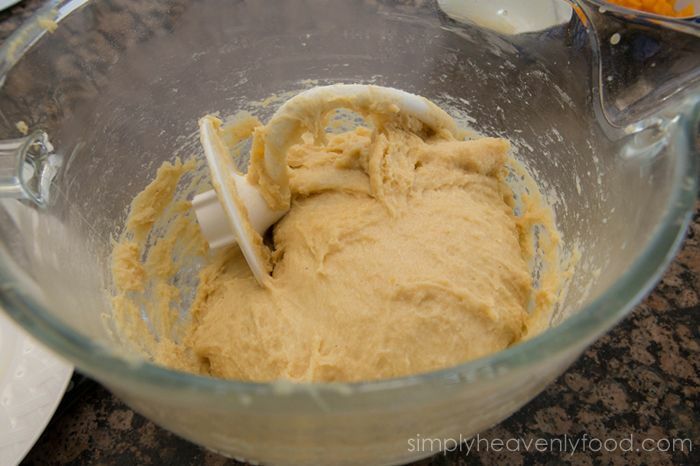 Place dough in a large buttered bowl. 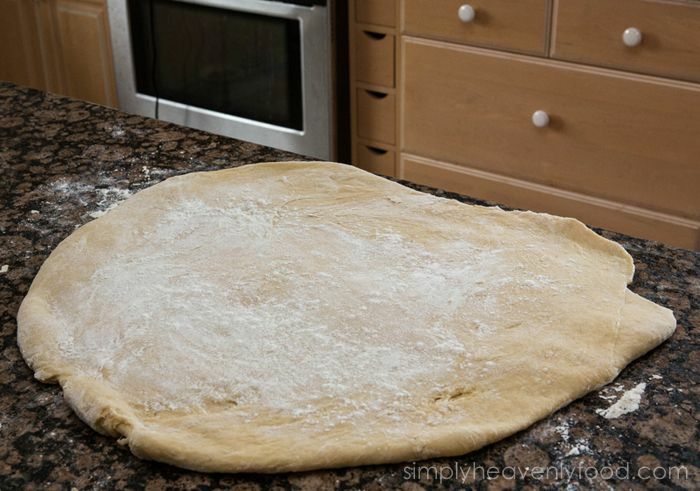 Cover bowl with a kitchen towel, and let dough rise in a warm place until doubled in bulk, 1 to 2 hours. Punch down the dough, and cut in quarters. Roll each piece into a 12-by-8-inch rectangle. Brush with melted butter, then fold one long side to the center. Fold other long side over first side, overlapping it by 1 inch. 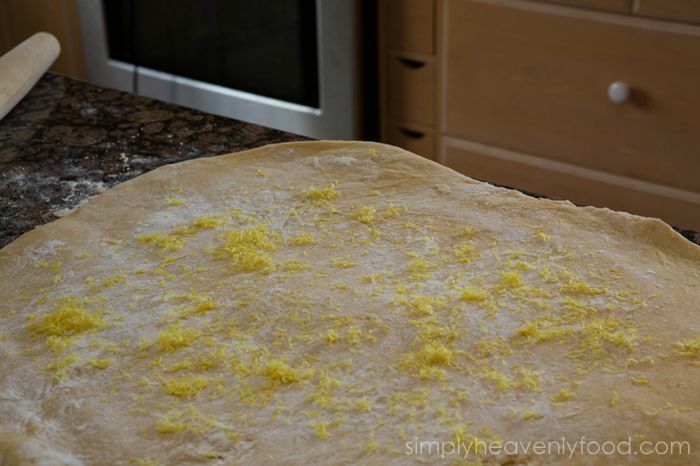 Turn dough over, taper the ends, and place on parchment-lined baking sheet. 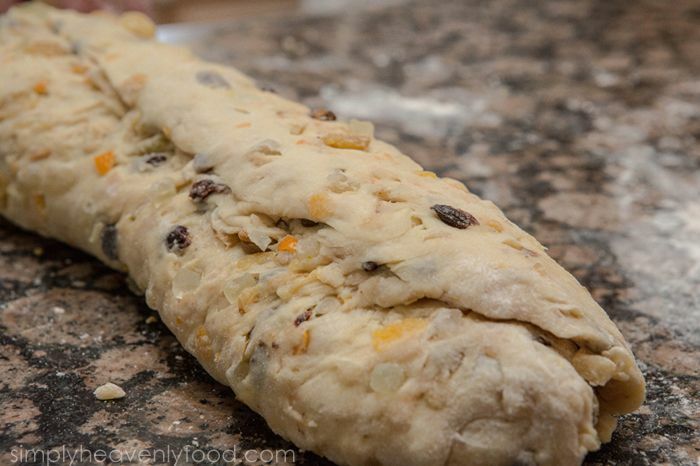 Repeat for remaining 3 loaves, using a second parchment-lined baking sheet for the third and fourth loaves. 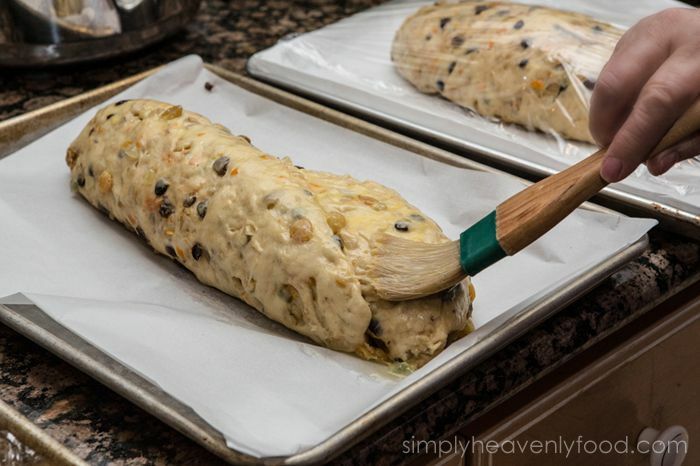 Cover loaves with plastic wrap; let rise again in a warm place, 1 to 1 1/2 hours. Heat oven to 350 degrees, with two racks centered. 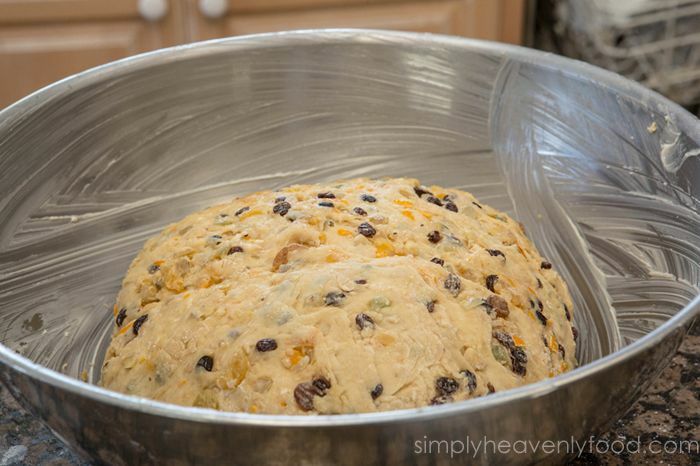 Bake stollen until golden brown, about 35 minutes, rotating the sheets between the racks halfway through baking. Cool on wire rack; dust with confectioners' sugar, and serve. 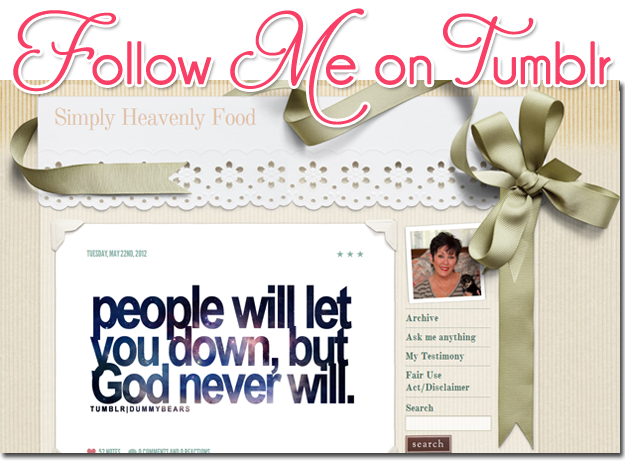 I do something different at the end so look through the photos for my step-by-step directions. 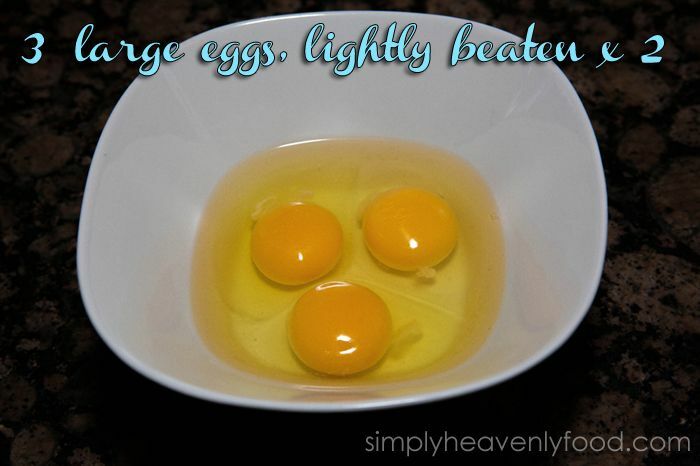 It's a simply heavenly recipe. 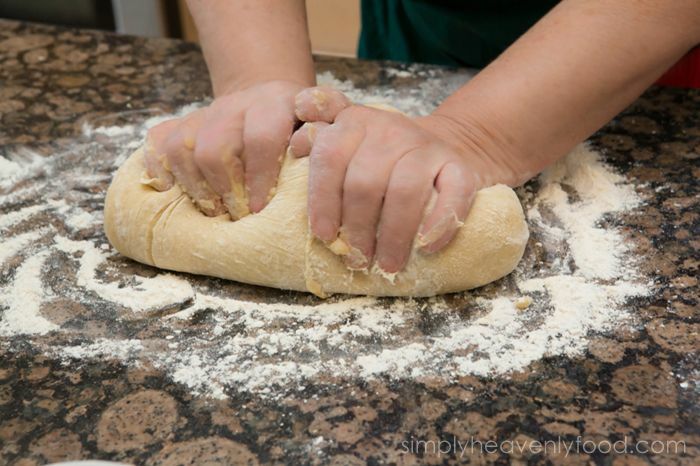 Knead the dough until it is no longer sticky and is soft like a babies skin. Now it's time to add all the goodies one at a time. 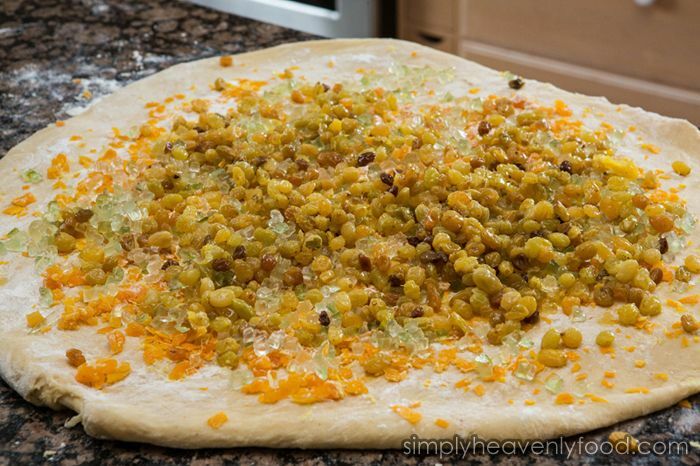 Sprinkle the lemon zest evenly over the surface of the dough. 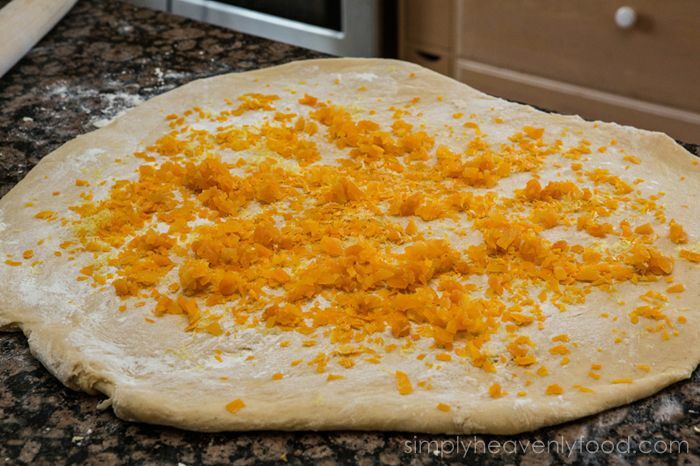 Now add the orange peel and the apricots on top of the lemon zest. The smell is simply heavenly. It's a fresh citrus scent that really envelops your senses. Yum. Now it's time to add the citron that you have diced up. 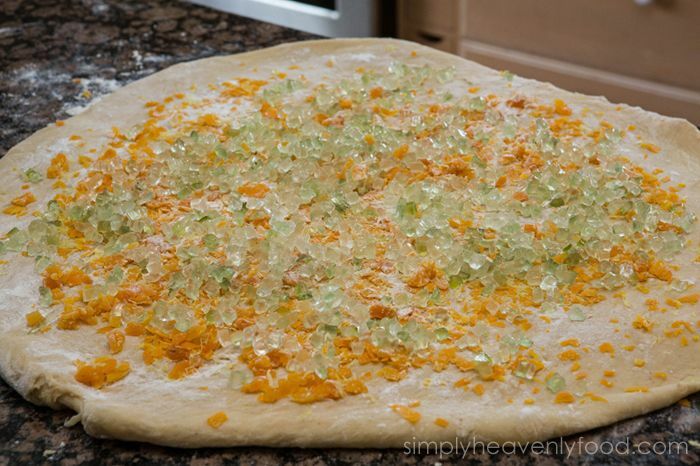 It's kind of gummy but it adds such an intense citrus flavor and sweetness to the bread. And now it's time to layer the black currants that have been soaked overnight in Courvoisier or any Cognac you prefer. (Courvoisier really adds something amazing to the flavor of the currants and all the alcohol cooks off while you're baking it in the oven). 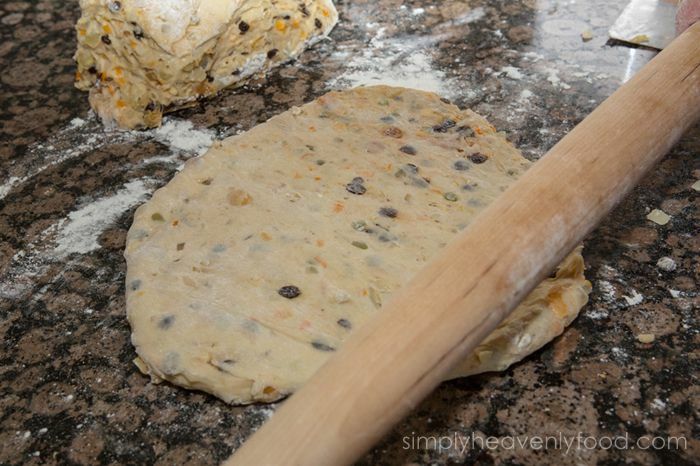 Sprinkle the almonds over everything and press it all in to imbed it into the dough. 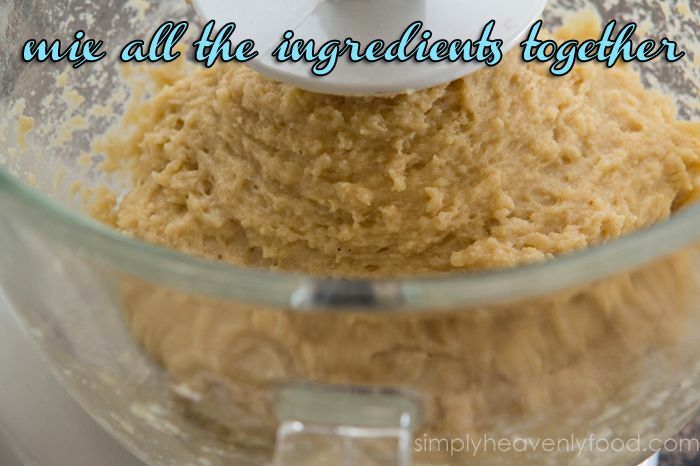 Now you're going to fold the dough so the ingredients are evenly incorporated throughout the entirety of the dough so every delicious bite will have a good amount of all the ingredients. 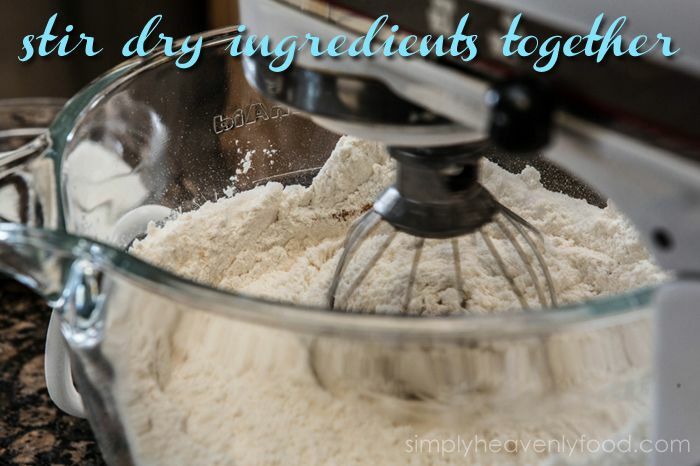 Continue folding in the ingredients. This takes a little time so be patient. 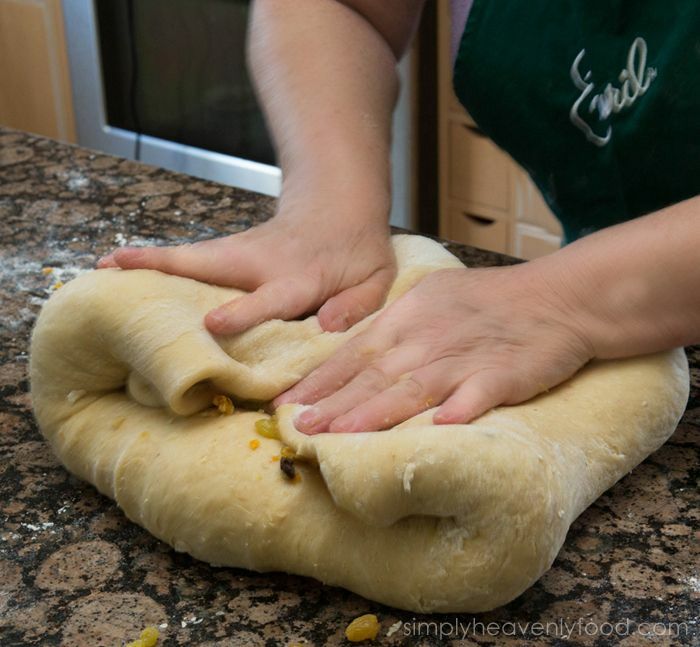 Fold and knead it all in. It kind of reminds me of that scene in Sleeping Beauty where one of the fairies is folding the eggs into the cake mix but this time, it turns out delicious. 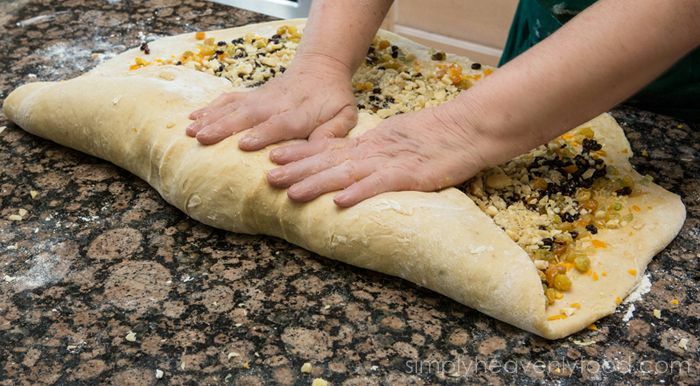 Fold and knead over and over until the ingredients are evenly incorporated throughout the dough. It's a lot of work but it's so worth it. Ta da!! 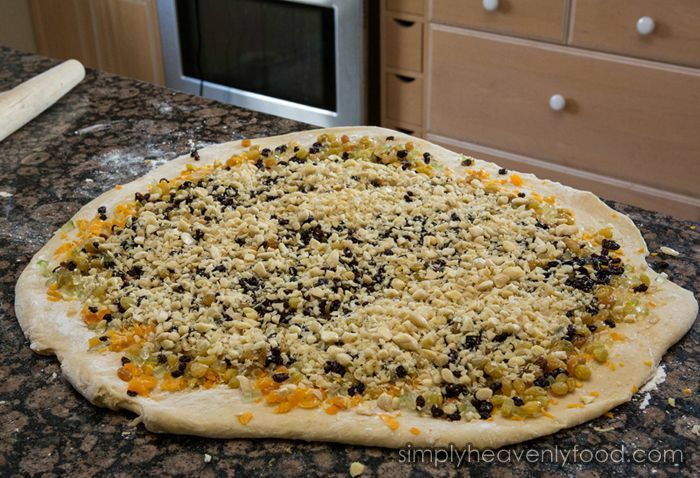 Now all the goodies are evenly spread throughout the dough and it's ready to sleep for an hour so it can rise. 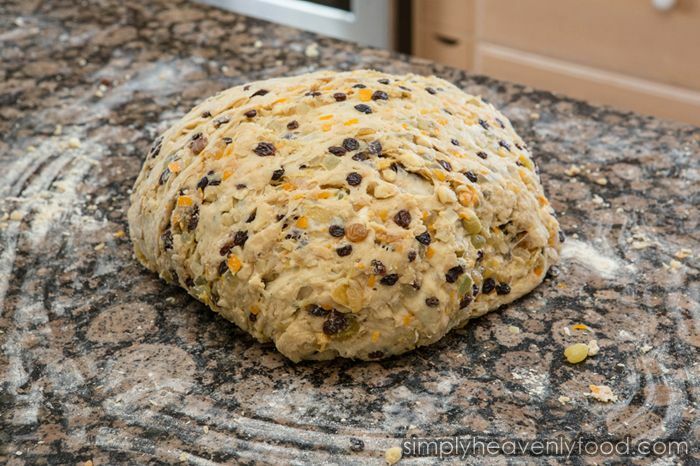 Sit the dough in a pan that is lined with butter and cover it with plastic wrap so it can rise sufficiently. This process usually takes an hour or so (depending on the temperature of your home and the humidity). You want to let it sit until it has doubled in size. 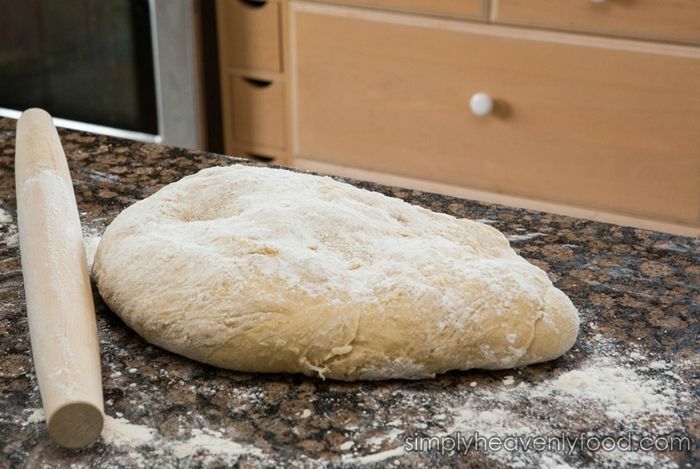 Once the dough has risen, punch it down and cut it into quarters (one for each loaf) and roll it out. 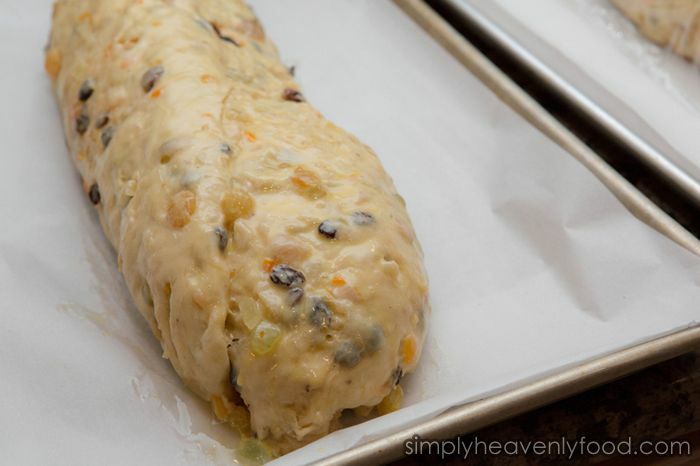 Roll the flattened dough up into loaves and place it on the parchment lined baking sheets. Now that it's on the baking sheet, paint it with an egg wash which is made of just 1 egg and a teaspoon of milk. 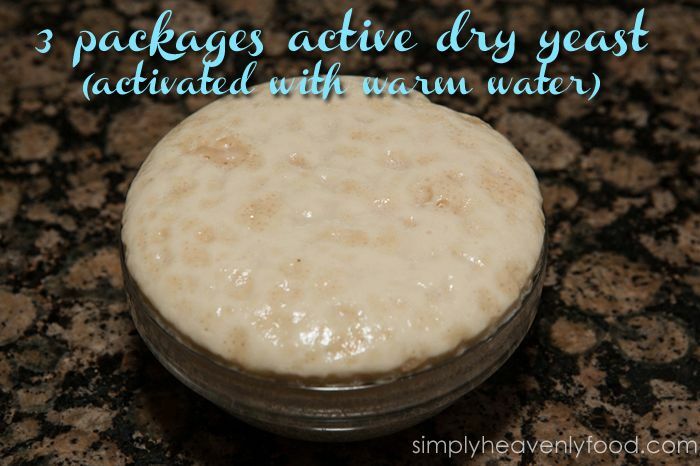 Cover with plastic wrap and let it rise until doubled. Ta da!! 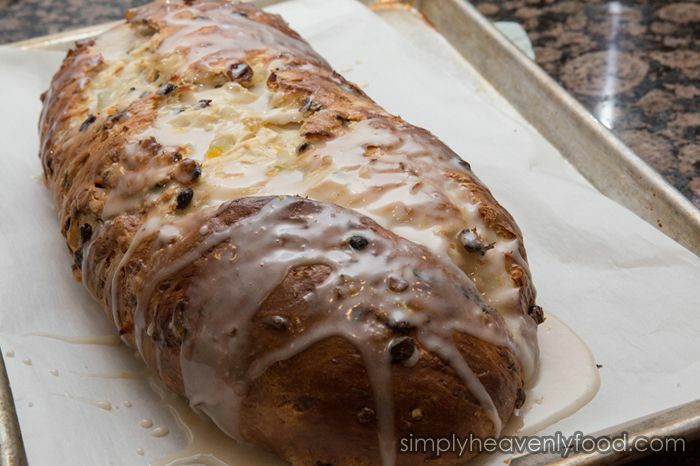 Now your stollen is perfectly baked and it's time to add a glaze to it instead of the confectioner's sugar powder that Martha adds. 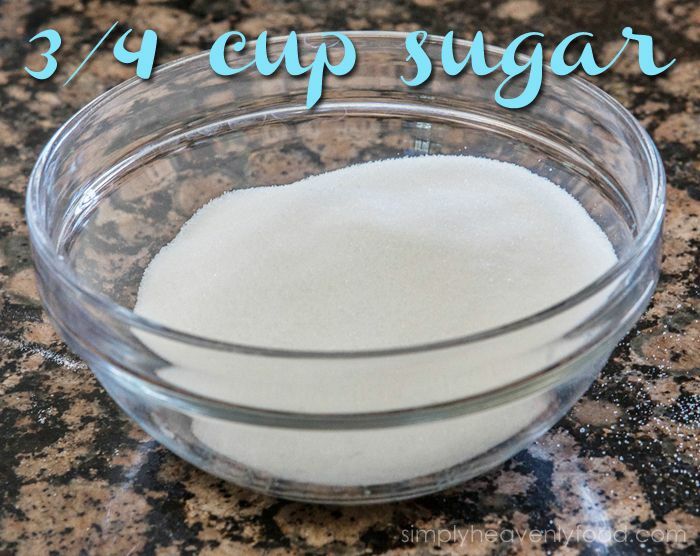 The glaze is easily made with about 4 cups of confectioner's sugar, juice of 1 lemon, and a sprinkle of milk until you get the consistency you want in the glaze. This adds so much flavor because the bite of lemon in it really enhances the citrus flavors in the bread perfectly. Here's a closeup of the final product. 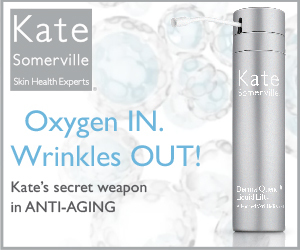 Simply Heavenly! Now it's time to cut and serve. Believe me, your family will love it so much that it will be gone within the day. My family literally inhaled it when I baked it this year. I wish you all a very Merry Christmas!! God bless you! 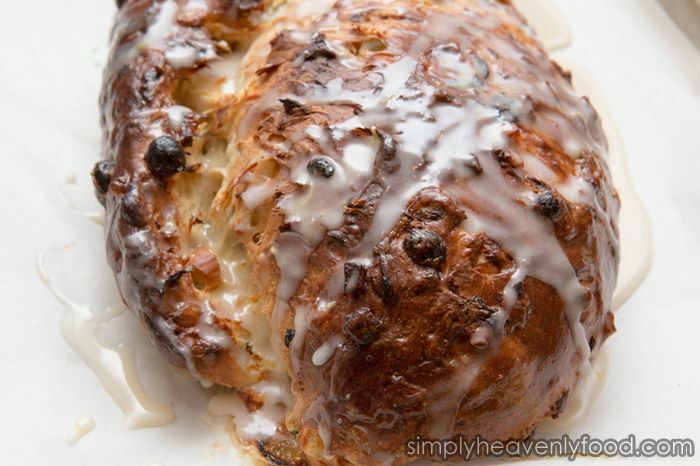 Why only cook this sweet treat on Christmas? It looks good enough to eat year round.